VATICAN Pope: No one be distanced from God because of man-made obstacles! 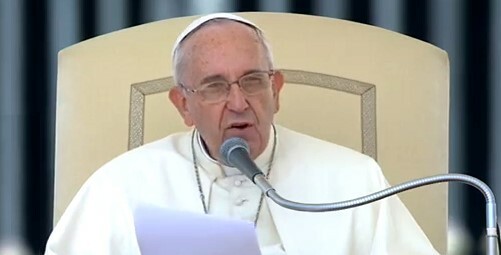 Pope: No one be distanced from God because of man-made obstacles! At an extraordinary Jubilee audience, Francis returns to the theme of reconciliation, "God has never failed to offer his forgiveness to men: his mercy is felt from generation to generation." An appeal to confessors: "You are in the place of God the Father." A special Jubilee greeting for the police and the Armed Forces: "Faced with every day challenges, irradiate Christian hope, which is the certainty of the victory of love over hatred and peace over war." Vatican City (AsiaNews) - No one should distance themselves from God because of the obstacles posed by men, said Pope Francis this morning during the monthly extraordinary Jubilee audience. The pontiff then added spontaneously: "And this is true - and I say underlining it - for confessors: It is valid for them: please, do not put obstacles in the paths of people who want to be reconciled to God. The confessor is to be a father! He is the place of God the Father. " The theme of the meeting, was "an important aspect of mercy: reconciliation. God has never failed to offer his forgiveness to men: his mercy is felt from generation to generation. Often we believe that our sins distance the Lord from us: in reality, sinning, we are the ones who distance ourselves from Him, but He, seeing the danger, seeks us out even more. God is never resigned to the possibility that a person remains distant to his love, provided, however, He finds in them some sign of repentance for the evil done". Our own strength, however, is not enough to reconcile us to God: "Sin is really an expression of rejection of His love, with the consequence that we close in on ourselves in the illusion of finding greater freedom and autonomy. But distant from God we do not have a goal, and we are no longer pilgrims in this world but "wanderers". A common saying is that when we sin, we "turn away from God." That's it: The sinner sees only himself and thus pretends to be self-sufficient; for this reason, sin distances us ever more from God, and this can become a barrier. However, Jesus comes to look for us like a good shepherd who is not content until he has not found the lost sheep (cf. Luke 15:4-6)”. Quoting the Apostle Paul - "Be reconciled to God!" - Francis adds: "Let us be reconciled with God! This Jubilee of Mercy is a time of reconciliation for all. Many people would like to reconcile with God but do not know how, or do not feel worthy, or will not admit it even to themselves. The Christian community can and must encourage a sincere return to God for those who feel his nostalgia”. Especially those who carry out the ministry of reconciliation "are called to be docile instruments of the Holy Spirit, so that where sin abounded the mercy of God may abound. No one should be distant from God because of obstacles placed by men". And this is also true, he added moving from his script, "and I say underlining it - for confessors – it is valid for them: please, do not put obstacles in the paths of people who want to be reconciled to God. The confessor is to be a father! He takes the place of God the Father! The confessor must welcome people who come to him to be reconciled to God and help them walk this path of reconciliation. It is a beautiful ministry: it is not a torture chamber or an interrogation, no, it is the Father who receives and welcomes and forgives this person. Let us be reconciled with God! All of us! This Holy Year is the favorable time to rediscover the need for tenderness and closeness to the Father to return to Him with all our heart. " Experience of reconciliation with God, the Pope concludes, "allows us to discover the need for other forms of reconciliation: in families, in relationships, in the ecclesial communities, as well as in social and international relations. Someone told me a few days ago, that there are more enemies than friends in the world, and I think he was right. But no, we must build bridges of reconciliation even among us, beginning in our own family. How many siblings have quarreled and become distant over even an inheritance. This will not do! This year is the year of reconciliation with God and with one another! In fact, reconciliation is a service to peace, the recognition of the fundamental rights of the people, solidarity and welcome for all". Before special greetings to various groups, Francis also welcomed "with joy" the representatives of the armed forces and police, from many parts of the world, who have come on pilgrimage to Rome for the extraordinary Jubilee of Mercy: "The police - military and police - have an objective to ensure a safe environment, so that every citizen can live in peace and serenity. In your families, in the various areas in which you work, be instruments of reconciliation, bridge builders and sowers of peace. " The affirmation of peace, he concludes, "is not easy, especially because of the war, which withers hearts and increases violence and hatred. I urge you not to be discouraged. Continue your journey of faith and open your hearts to God the merciful Father who is never tired of forgiving us. Faced with the every day challenges irradiate Christian hope, which is the certainty of the victory of love over hatred and peace over war".